Integrate Data for Excel (OfficeSheet: OS4XL) is a fully functional client application for Excel providing a portal into Excel data and functionality for data intensive work tasks. Integrate Data for Excel enhances the operation and use of Excel by integrating it into an overall information work flow in a number of areas. Integrate Data for Excel provides fast and precise data acquisition from Excel worksheets based on names, selected areas or explicit ranges. The application can import cell data as well as additional information such as comments, links and formats. Metadata can also be acquired such as file names and properties. This feature of Integrate Data for Excel is particularly useful for creating database tables from complex and fragmented Excel data sources. Integrate Data for Excel provides a range of functions for manipulating data across multiple workbooks and sheets such as copy and append with intelligent data structure solving. Integrate Data for Excel assists to integrate data from multiple spreadsheets that have been manually edited. The application logically breaks down formatting added for reporting purposes by conditioning and manipulating the data to make it comparable for integration. 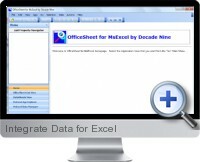 Integrate Data for Excel includes numerous functions to integrate data into a single structure. It avoids re-typing, or dangerous manual copying and pasting from one sheet to another. Integrate Data for Excel can also analyze data frequency and perform functions based on indexed data such as look ups, updates and merges. Integrate Data for Excel provides methods for data reduction and summarizing. This is a powerful alternative to pivot table reports as the resulting integrated data summaries can easily be used within other applications without sending the source data. Integrate Data for Excel enables to rapidly distribute information to different correspondents as either integrated data or the sources of raw data to obtain missing or invalid information. Finally, Integrate Data for Excel can redistribute the output by pushing the information back to original or new Excel worksheets.